The thunderbird’s name comes from the common belief that the beating of its enormous wings causes thunder and stirs the wind. The Lakota name for the thunderbird is Wakį́nyąn, from wakhąn, meaning “sacred”, and kįyą, meaning “winged”. Across many North American indigenous cultures, the thunderbird carries many of the same characteristics. Tags: Jennifer Jesse Smith Jewelry, Native Jewelry, Rings, Soul Of The West, Southwestern Jewelry, Sterling, Thunderbird Jewelry. 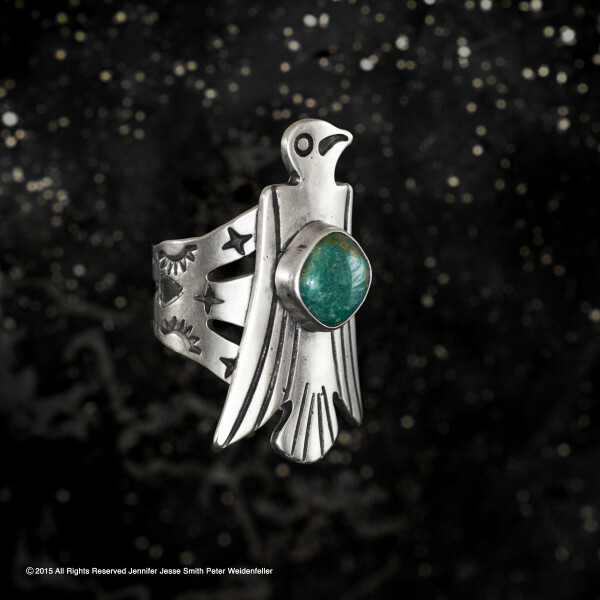 The “Long Bird” ~ JJS Thunderbird Ring. Hand fabricated in sterling silver with natural turquoise. Your choice of green or blue turquoise and custom sizing options.